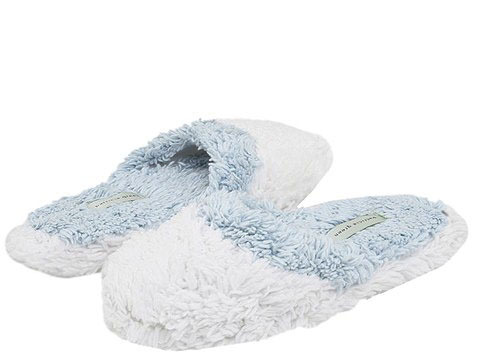 In the market for fuzzy slippers? These are called “Shagilicious” by Patricia Green. Credit: Zappos.com. More and more Americans are working from home. According to the latest numbers from the US Census Bureau, about 13.4 million Americans worked from home at least one day a week in 2010, an increase of about 1.6 million from 2000. That accounts for almost 10% of the entire U.S. workforce. Zero commuting! No driving, no gas money required, no parking costs or hassles, no wear and tear on the car except for appointments. You have more time to spend on work and there’s no loss of time from commuting. The ability to set your terms and limits. In terms of a workload, I try to stay between 30-40 hours per week. Owning your own business also means you can choose clients and projects. Not that I say “no” that often, but if a project or client doesn’t resonate with me or doesn’t represent something I believe in, I have the ability to “pass” and say “thanks for thinking of me, but no.” I enjoy maintaining a variety of clients who challenge my work skills on several levels, involving a mix of marketing, PR, and freelance writing, with a dash of photography. Being motivated has its rewards. Freelance work, especially freelance writing, relies heavily on skills like creativity and perseverance. Working for yourself can provide a great sense of satisfaction when freelance assignments are accepted by editors and magazines for example. Few interruptions. I find that my work flows better without the frequent interruptions experienced in a typical office setting. This is most beneficial for writing! Flexibility in scheduling. I try to pace myself in order to power through my work projects Monday through Thursday so that I can give myself every Friday off. It doesn’t work every week, but it’s a great feeling when it does. Friday serves as my “back-up day” to finish projects, make calls, or tie up loose ends. If I can complete my work by noontime on Friday, I still feel a great sense of accomplishment. Family flexibility. Being able to schedule around my children’s sporting events, doctor appointments, etc, is simply invaluable. Being at home when my children arrive home from school is also a bonus. Maintain a structure to your day. It’s helpful to set “work hours” for yourself and then stick to them. Be disciplined. That being said, build small breaks into your day or else you’ll burn out. Reward yourself with several small breaks, just 5 or 10 minutes to take a short walk outside, make a personal phone call, or grab a healthy snack. These pockets of time can also be very helpful with household chores such as throwing a load of laundry into the washing machine or popping dinner into the oven. Switching gears and taking breaks is reinvigorating, especially when you incorporate physical activity. Make sure you don’t “forget” to return to work. Set goals for yourself. Set daily goals every morning and weekly goals every Monday. Check them frequently to make sure you’re on task. Define your work area. Make is as functional and professional as possible so that it helps you set the tone for productive workdays. Are you self-employed? Do you work from home? Please pass along your tips and strategies too! ← Take a SNOW DAY! Enjoy it !!! I can’t !! This post describes working from home perfectly. I have done so as a freelance proofreader/writer, as well as for a time for a non-profit doing administrative work. However, that came after nearly a year of having established my work ethic in their office 45 minutes away and was not something my boss wanted me doing every day. Now that I am smack-dab in the middle of raising a preschooler, I have lightened up on how assertive I am about finding work — taking only those projects I believe keep me “in the loop” in my field. That way, once my son goes to kindergarten I will still have one foot in the industry and can hopefully add projects when I am home for longer periods of the day! Oh, and … I DO wear fuzzy slippers, everyone (insert warm and cozy emoticon here)! Thanks so much for your kind words. And you raise a great point: Working from home when your children are young provides the perfect way for you to keep your foot “in the door” and maintain your career until you’re ready to resume more regular work. As for your fuzzy slippers… enjoy! Great post, as always. Spot on! Now that I spend some time at an office, I really appreciate the hours I can work from home, especially when I have a lot to write.